June 8, 2011  There's always a trade off in finance between safety and economic growth. Fed Chairman Ben Bernanke and JPMorgan CEO Jamie Dimon square off. January 7, 2011  But the Fed chairman says economic growth is likely to remain too slow to significantly boost job growth -- and that the nation's unemployment rate will likely still be at 8 percent or above two years from now. December 8, 2010  Bernanke contradicted himself on the same news show inside a year regarding the Fed's "printing money." The central banker told 60 Minutes a year ago the Fed was printing money. Now he says it isn't -- and blames it all on a myth. November 19, 2010  Bernanke said the Fed's $600 billion Treasury bond buywas just another way to do what the Fed does when it lowers key interest rates. The alternative, he said, was to risk more unemployment and economic woes in the U.S. and eventually the world. November 19, 2010  Speaking in Frankfurt the Fed Chairman bluntly criticized countries who keep their currency undervalued. He says any problems caused them by the Fed plan, are basically their own fault. 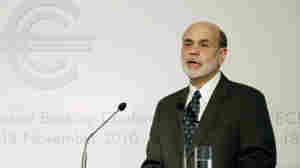 November 9, 2010  Bernanke will appear to ignore political pressures since markets want him to appear independent. September 2, 2010  Fed Chair Ben Bernanke was optimistic that the too-big-too-fail problem will shrink because of market and regulatory forces. Members of the Financial Crisis Inquiry Commission weren't so sure. 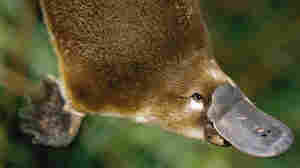 February 25, 2010  Federal Reserve Chairman Ben Bernanke recently compared Fannie Mae and Freddie Mac to a platypus. Here's what he means, and why it may be cause for concern.